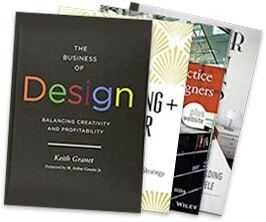 Hey, design lovers! 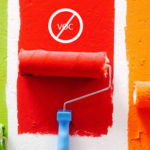 This week I have been looking into interior design for cats! I have been scouring the internet for info on cute kitties and their living arrangements all in the name of research. 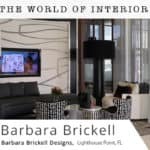 This is a HUGE trend in interior design, for people who love their feline buddies and want to make their home compatible for them too. 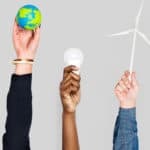 Cats prefer to perch in high places and can become frustrated if they don’t feel challenged by the toys that they have. 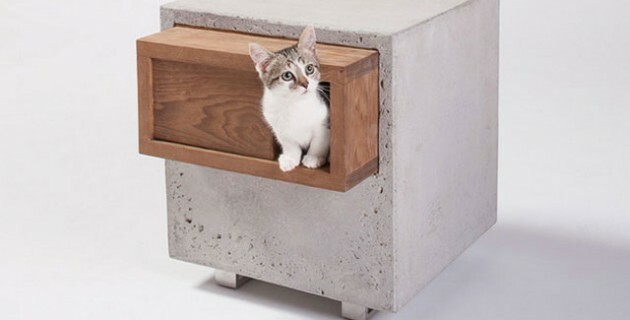 There is an abundance of cat stuff out there for the home, but these feline friendly interior solutions will fascinate you! With catwalks, staircases and bridges that allow the kitty to stretch their imaginations, this is really the cream of indoor living! 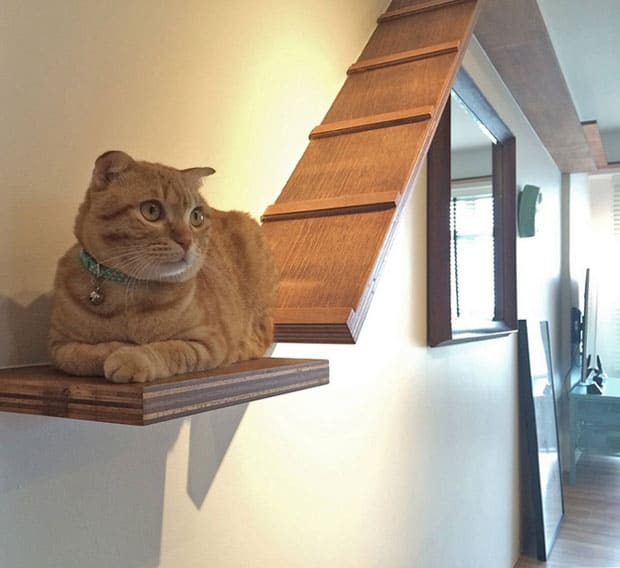 This catwalk by design firm The Association in Singapore features an upper level of shelving that is just purrrfect for a kitty to walk around. 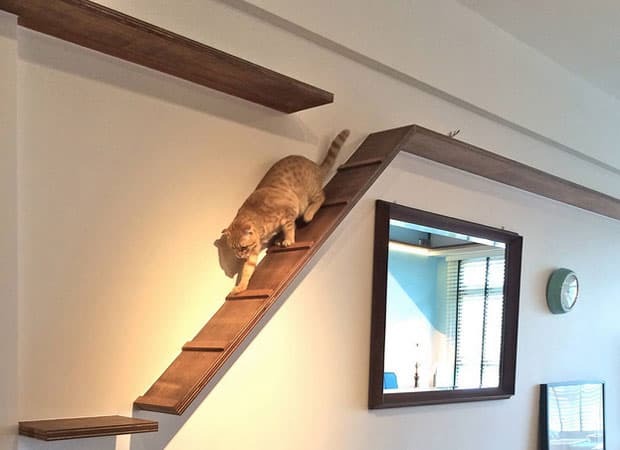 With various levels and places to stop and perch for a rest, any cat would enjoy exploring and using this simple yet effective design. What could be more fun for them than exploring the room on their very own catwalk! 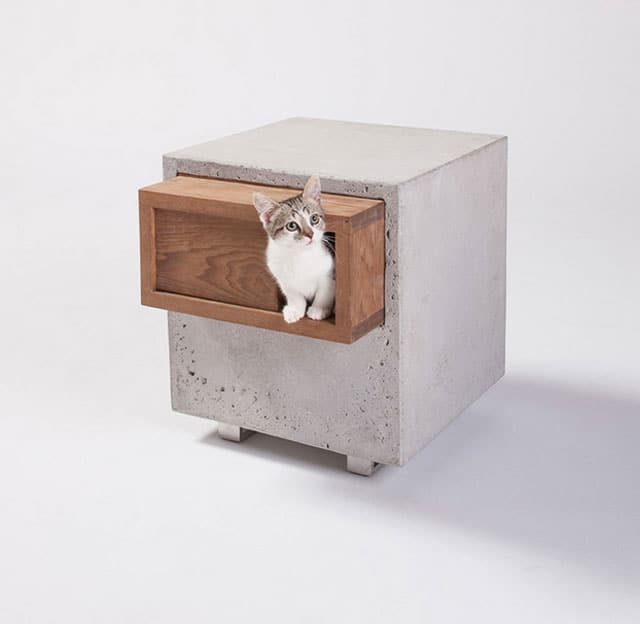 Another innovative design idea for cat lovers is the ‘House for Coexistence with Cats’ by Sohei Nakanishi Design. This house is located in Japan and was built to house the owner and seven cats. The cats have their own playground in the ceiling to hide and explore, with multiple exit holes for them. If the cat feels lonely, he can pop his head out to say hello and see what is happening in the room below. The cats love to climb in and out, up and down when left alone, making sure they are entertained when their owner is not around! I love the frames that surround the holes, like the cat is part of a live motion art exhibit! 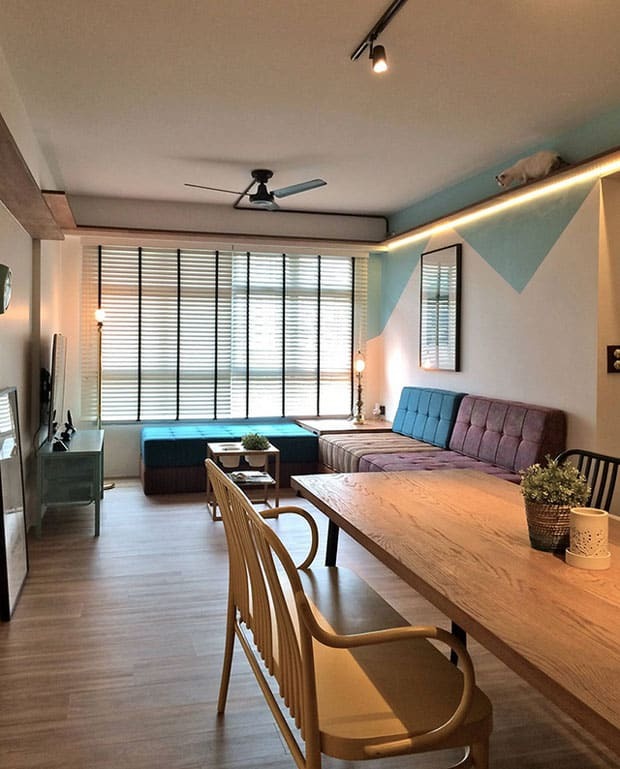 The perfect cat house by C Thinking Design firm in Taiwan is a cat’s dreamy idea of playtime I’m sure! 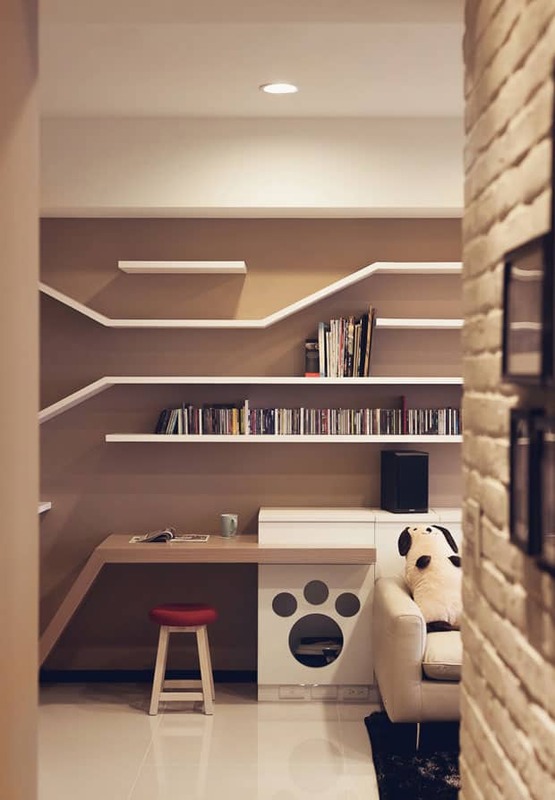 Doubling up as bookshelves that are climb friendly and design friendly, this fun-filled design has layers of shelving with gaps for the cat to climb and turn to explore up or down. 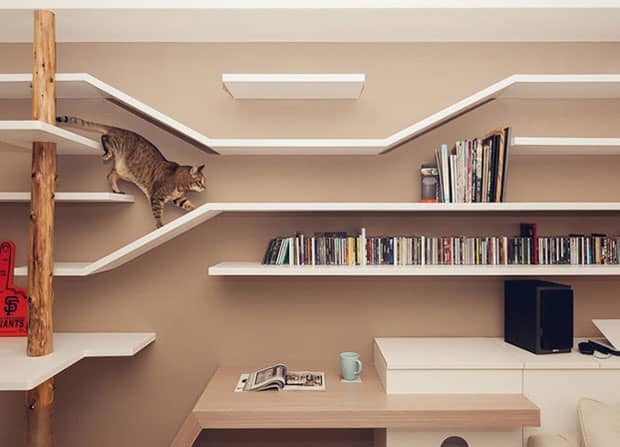 Shorter lengths of shelving are available for the cat to sit and perch for a rest and think about where to go next! 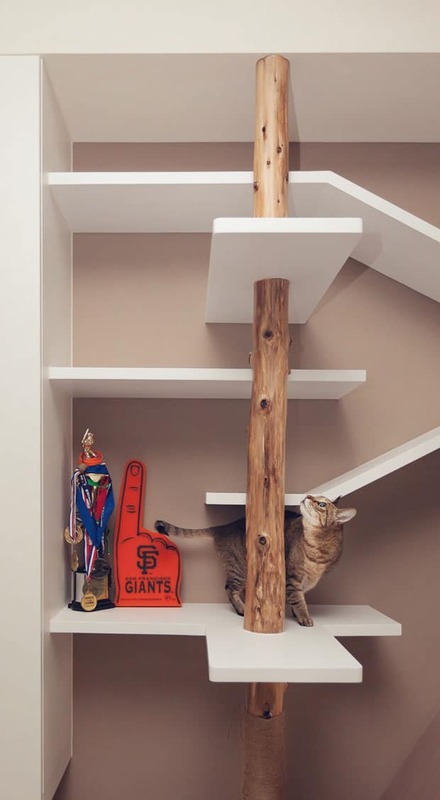 A length of wood is also placed for the cat to use as a scratching post, this room really has thought about the cats’ every need and want! 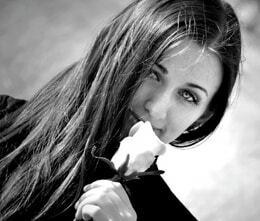 Oh and one more thing! 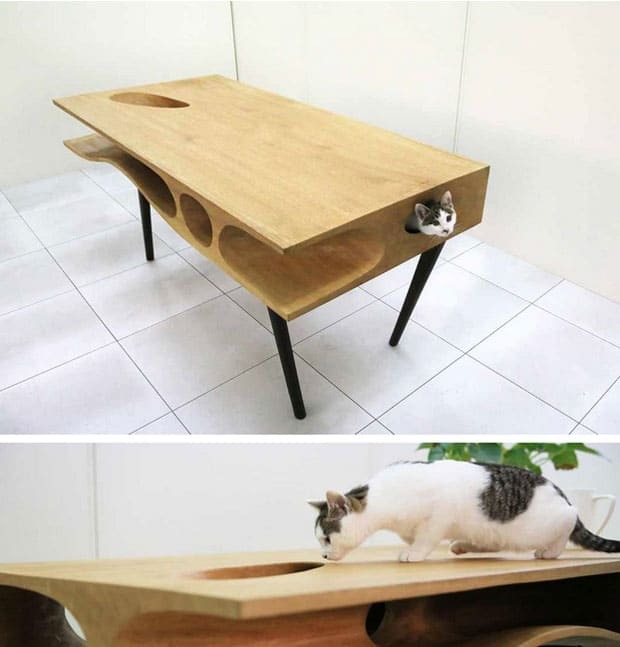 - What could be more awesome for your beloved kitty, than having a table that they can crawl around inside to explore and sleep in. 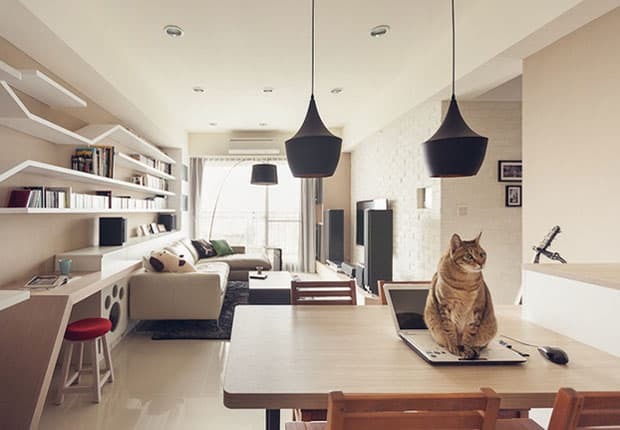 This CATable created by Ruan Hao who works for an architecture firm based in Hangzhou and Hong Kong, will keep your cat entertained for a long time! With tunnels and holes for him (or her) to pop out of, this table looks like a whole lot of fun!